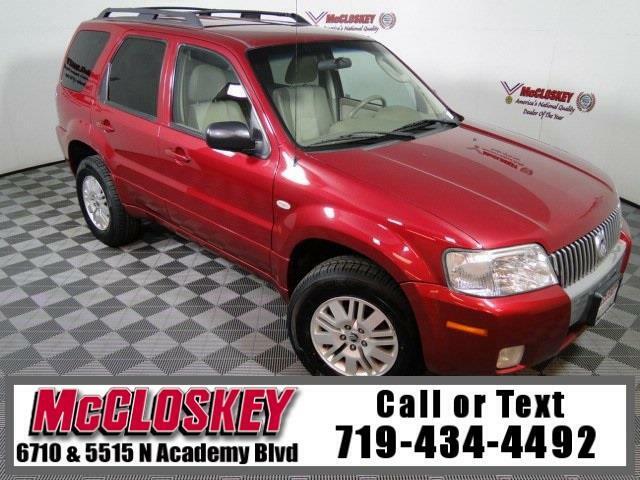 Stylish and capable 2006 Mercury Mariner Luxury with Leather Power Seats, Towing Package, Powerful 3.0L V6 Engine, Cruise Control, and Much More! The Luxury adds a 3.0-liter V6, a power driver seat, a six-disc CD changer, an alarm system, message center with compass and an auto-dimming rearview mirror. Standard on Luxury and Premier models is a potent 3.0-liter V6, which makes 200 hp and 193 lb-ft of torque. The Mercury Mariner boasts a stylish interior with satin aluminum, chrome accents and a two-tone color scheme. The 60/40-split rear seat includes three-point seatbelts and head restraints for all three seating positions. This vehicle passed our 110 multi-point inspection and is backed by our National Quality Dealer of the Year Award. We are an ''A+'' Better Business Bureau Rated Business. We offer low interest rate financing, low down payments and the highest trade allowances in the state! Here at McCloskey we do things a bit differently, we shop our competition every day to ensure a great value to you. Come on down and experience it for yourself. This McCloskey Assured vehicle includes a Vehicle History Report!! At McCloskey we strive to provide ASSURANCE, TRUST, VALUE AND QUALITY! Call 719-434-4492.